Many of us subscribe to newsletters from theHorse.com. I just received the first edition of their Nutrition e-newsletter, which links to an article called Nutritional Value of Forages . This hit one of my hot-buttons - perpetuating the myth that what we need for our horses is poor quality hay. “Sometimes a little straw filler might be okay,” he said with a smile. In other words, lower-quality forage will keep your horse busy longer, is less likely to make him overweight and/or laminitic, and he’ll eat more of it to get energy--keeping his stomach full and at lower risk of ulcers. What our horses do need is the best quality horse hay and forage we can afford - not lower quality. Everyone, from growers to veterinarians to horse owners needs to review their definition of high quality forage for horses - which is different than the definition for high quality meat or milk production animal forage. This difference does not make it any lower quality - just different. Low quality forage (including "straw", which can be extremely high in sugar) or insufficient quantities of forage can cause nutritionally-based problems. By the time you see the signs on the outside - dull coat, lackluster attitude, poor hoof quality - the changes have already occurred on the inside. The DE needs to be low enough that the horse can consume sufficient forage to ensure good gut function without taking in too many calories. Most of us are learning by now that the only way to accurately determine if a hay or forage is appropriate for our horse is to have it tested (see Analyzing Hay and Feeds) and using the results to determine if corrections are needed. While sugar and starch in forage, as emphasized in the article, are important for metabolically challenged horses, there is a lot more you need to know about the nutritional value of the forage you give your horse. What works for your pasture ornament may be inadequate in many ways for your performance horse, and what works for your performance horse when he is training/working might set him up for laminitis when he's idle. Forage testing (even if only done as "spot checks" for an idea of what you're feeding if you can't store large quantities of hay) is cheap insurance - at $30 to $50, a lot less than a vet bill. "Correcting" excesses and deficiencies by targeted mineral balancing can be done economically - often for a lot less than buying an "off the shelf" standard supplement which may or may not provide what's needed (and often adds a lot of "stuff" that's not needed). So - when looking at forage for your horse, think in terms of the "best" quality you can afford. Take words like "rich" out of your vocabulary; they tell you nothing about your hay. Forget "old", "last year's", "poor quality" and "straw" when trying to find low sugar/starch hay. Think in terms of how many Mcal your horse needs per day, how many grams of protein he needs, and calcium/phosphorus balance based on test results, not on whether it's "grass" or "alfalfa". Look and test for sugar plus starch equal to 10% or less for an IR or laminitic horse - low sugar/starch does not mean compromising on energy, protein or quality. Avoid excessively high iron levels in forage if you can - it may be an indication of poorly maintained fields or high surface contamination, and has been shown to be "pro-inflammatory". And use the straw for bedding your cows and goats. As cold weather approaches (and already here for those in the North), we need to continue to pay attention to our horses' water intake. Horses who are used to obtaining some of their fluid from grasses may not increase their water intake as pastures brown up or as their winter ration begins to include more cured hay. The maintenance water intake for an adult non-working horse is around 5 L per 100 kg/BW (NRC 2007, p132). This translates to about 1.3 gallons for each 220 lbs your horse weighs. You can figure your horse's minimum requirement by dividing his weight by 220, then multiplying by 1.3, or you can find the closest weight in the chart below. These requirements are increased by dry, windy or warm weather conditions, work or lactation. Most of us are aware that working horses lose water in sweat during work but don't always consider that substantial moisture is also lost from the respiratory tract. Unless you weigh your horse before and after work, it may be easy to underestimate the amount of total fluid loss in cool, dry conditions when sweat may evaporate quickly. It's important that you become familiar with signs that may indicate dehydration - elevated heart rate or poor heart rate recovery, elevated respiratory (breathing) rate, dry mucous membranes, skin tenting - and to know what's normal for your horse. Mares with suckling foals are providing fluid for two and their water requirements are two to three times normal maintenance needs. These requirements are also increased by warm, dry or windy conditions. If you use automatic waterers or floats, it's impossible to measure water intake unless they are fitted with a meter. A horse may also become dehydrated if the auto waterer should freeze or malfunction. If you notice your horses' water intake dropping off, it may be necessary to warm their water either by adding a heater (with a GFI electrical circuit for their protection) or by adding warm or hot water to their tanks or buckets. Feeding salt on a regular basis at the NRC recommended levels helps ensure an adequate thirst response. After the interstitial fluid has reached an equilibrium, excess sodium, in the absence of disease, will be excreted by the kidneys. The minimum requirement for sodium in a 1,000 lb horse ranges from 9 grams at maintenance, 16 grams in moderate work, to 37 grams in very heavy work. This is roughly equivalent to a range of from 1 to 3+ ounces of salt per day. Forages may supply as little as 1 to 2 grams of sodium per day. The best way to making up the sodium deficit is by adding salt directly to the feed. If using a salt block, the amount of sodium it provides should be calculated and the horse's consumption monitored to ensure adequate intake. These requirements remain steady except when accounting for sweat loss during work - which can cause large increases. Many "commercial" electrolyte formulas contain high levels of potassium but insufficient sodium and chloride - you should have an understanding of what you actually need before simply adding electrolytes (and never give electrolytes to an already dehydrated horse). A well hydrated horse will more easily handle the extremes of winter weather and activity. Taking the time to monitor his water intake can set your mind at ease, knowing that you've minimized his risk for cold-weather related colic and respiratory problems. Purina's foot dragging in their recent feed recall (or "retrieval", as they preferred to call it) has left us wondering about safety and quality control in our horse feeds. Some mistakes may make it out the door with even the best quality control but in horse feed, as in politics, it's the response that matters. About a week ago (June 3rd) I bought a couple of bags of Eagle Milling brand beet pulp pellets. It was getting dark when I got home, but I went ahead and dumped them into the the heavy duty trash can I use to store them in. I couldn't see the pellets well in the dark and didn't take a real good look until I had finished up the remaining previous stock and started to feed the new ones Friday evening. I noticed that about half the pellets were pink-brown, not the usual color - which is kind of a "frosted" deep green. There was also quite a bit of corn mixed in, along with some tiny pellets and a lot of "dust", which looked like it might be from the tiny pellets. This is not adding up to something I want to feed my insulin resistant horse - or, actually, any of my horses as I haven't a clue what's really in these pellets. Alfalfa? Grain? Minerals? There's something in there that's obviously NOT beet pulp. Fast forward to Monday morning (after spending a sweaty hour in Sunday's 104+ heat repacking the pellets into their bags to return). Stacy from Cargill called, wanting complete information about lot numbers, where and when purchased, etc., and she is making arrangements for a no-hassle exchange and appears to be genuinely interested in not having this happen again. It's complicated by the bags, even though purchased the same day, being from two different lots; we can't be certain which bag contained the mystery pellets. I received additional calls from the plant manager; they will send someone out to pick up the feed today. So what should you do if you open a bag of feed and its not what you expected? If you're feeding "straights", you are more likely to quickly spot if something is not "right". If in doubt, don't feed the product. It won't hurt your horse to miss a few meals as long as you're feeding sufficient hay. Contact the feed company directly if you suspect something is not right with a feed, don't just rely on the feed store to follow up. Document, document, document. Take pictures of the feed, the bag, the bag tag. If the photo doesn't clearly show the label/tag information, write it down. Write a description of what you see and smell that makes you believe there is a problem. If you suspect a feed or product has caused illness, in addition to notifying the feed company and your feed store, notify your regular veterinarian and your State veterinarian. Most State veterinarian offices are able to have feeds tested and can initiate action if necessary. You can also have feed analyzed for some of the common toxins on your own through one of the forage testing laboratories. When a product doesn't meet our expectations, our initial reaction is often to just discard it and resolve not to use that product or brand again, especially if no actual harm was done. Taking the time to throughly document the problem and notify the right people isn't always easy in our busy lives. But you will likely find, as I did, that conscientious manufacturers do care about quality control, appreciate that you took the time to notify them of a problem and will go out of their way to make resolving any issues simpler. Sure it's good business for a company to respond to customer concerns. But the rapid response and personal interest taken by the folks at Eagle Milling/Cargill reassures me that, had this been a serious or health related concern, there would be prompt action and resolution. He called the dealer to double check that they have shreds without molasses in stock so I can pick them up when I go into town tomorrow. Turns out Angel also works with the local 4-H swine program, knows all my friends. Vail, Tucson and large parts of Arizona are still pleasantly "small town". Ever start feeding something to your horse but now you're not sure if you should continue it or not? Is he moving better under saddle because of the new pad or the chiropractic session? Did his blood work results improve because of the new hay or did you change his supplement? Is he standing better or worse after the latest trim? Keeping a written or photographic log of changes and events can help us track how our horse is doing. A log can be anything from a spiral or looseleaf notebook to a spreadsheet or sophisticated computer program - the important part is that we write things down. After a few months the why and what of a change begins to get fuzzy and we may lose track of what works and what doesn't. What kinds of things should we log? Basic records should include routine care - vaccinations, hoof care, deworming, veterinary checks, any blood work done. You might keep these as a simple chart or spreadsheet. Nutrition - any changes to the diet should be recorded, including the reason you made the change and what results you expect. Pictures can be extremely helpful in providing an objective evaluation of the results. Not all nutrition changes will have obvious "surface" results such as change in coat or hoof quality or weight gain/loss, and some results won't be obvious for three to six months or longer. Some (such as increased bone density or tendon strength) are almost impossible most of us to measure but will be seen as lack of injuries or improved soundness. If you recorded your objective when you made the change (correct anemia, reduce allergic reaction, improve exercise tolerance) then, over time, you will be able to evaluate if you are seeing the expected results. If your objectives include things such as "attitude", you'll need to devise some way of "measuring" it. If you have your hay analyzed, keep the results - over a period of time this will give you your own "regional" forage profile. Keep feed tags any time you introduce a new feed. Vaccinations - the date, type, brand and lot number of all vaccines should be recorded (taking the information directly from the label). If your horse should have an adverse reaction, this information is necessary to file a report. Some metabolically challenged horses may react to the adjuvant/carrier in some vaccines (the reaction is seldom to the vaccine itself). Having a detailed record will help you and your vet decide if you need to change brands, pre-medicate or eliminate a particular vaccine if you horse has a reaction. Deworming - in addition to routine deworming, log any specific/targeted deworming, such as a Panacur power pak for encysted strongyles or a combo (Equimax) or double dose Strongid for tapes. If you do not do these routinely, note the specific reason (such as non-shedding coat or simply not "thriving") so you can evaluate if this was an effective intervention. Also log any "reaction" so you can consider pre-medicating the next time if indicated. Hoof care - if you are working with a horse with hoof problems, keeping a fairly detailed log will help you keep track of what works and what doesn't. Even minor changes (angles, type of padding, etc.) can have a dramatic effect. How your horse responds to changes in footing - rain/snow, mud, hard pack can help your hoof care provider/farrier determine what might be needed for your horse in your particular circumstance. Good quality, correct photos (front, side, solar views of each hoof plus a full horse views), along with copies of any X-rays done can be extremely useful as stuff can often be noticed in a photo that is overlooked when looking at the actual horse. Blood work - obtain a copy of any blood work you have done on your horse. The original lab reports will show the values obtained for your horse plus the laboratory "normals". Normals vary from lab to lab, and labs use different "units", so it's important to have copies that contain this information. If your veterinarian uses a portable blood analyzer at your barn, such as an "I-Stat", you'll have to write down the results if the machine doesn't have a printer - and ask your vet for the "normal" values so you can write them down. Even if you don't understand all the numbers and language on the report, having a baseline plus a record of changes will be helpful if you ever move or your vet retires. If you are tracking a condition such as Insulin Resistance, even a novice (with a little help) can track the rise and fall of glucose and insulin values. To learn how to understand your horse's lab work, the Pride Project guide (Susan Garlinghouse and Barney Fleming) is a great place to start, and Dr. Kellon's class on Understanding Blood Work will give you a working knowledge of the subject. Exercise/conditioning log - if you are involved in something like endurance, you are likely keeping a conditioning log already. A horse in rehab should have his response to exercise tracked - including time, distance and frequency. This will provide a guideline for advancing work, or show you the point where the exercise may have exceeded his current capability. In order to keep a good conditioning log, you need to know how to take your horse's vital signs - your vet can help you learn this. The AERC Endurance Riders Handbook contains good information on conditioning and doing your own "mini-vet exam" (see chapters six and twelve). Other changes - a "general" page is useful for keeping track of things that really don't fit into other categories, such as tack changes, introduction of new barn mates, or other events that may or may not influence your horse's overall demeanor. Something may seem insignificant at the time but, in retrospect, could provide a clue to something going on now. A slow recovery to "his normal self" after coming home from a heavy show schedule or trail riding weekend could just be from the change in routine. Or it could be a flag of joint or metabolic stress that won't show up again until he encounters a similar heavy workload in the future. Because you made a note, when he does come up "off" six months later, you'll know this isn't a "new" problem and this can help you form a plan to prevent it from developing into a chronic issue. Or perhaps you've been feeding a protein or amino acid supplement for six months and have been taking weekly photos to track improvement. When you started, you expected to see improvement in your twenty-something horse's top line muscling but, despite being at an appropriate weight and a regular exercise routine, his hips and withers are still a bit too obvious. Because you have objective information (the photos), instead of continuing to spend money on a supplement that isn't providing the expected results, you have your horse tested for Cushing's disease as you know one of the signs is muscle wasting. With a positive result, you can more effectively spend your money on pergolide to control the symptoms, ensuring your horse many more years of health and soundness. If you are trying to change something about your horse, anything you do for or to him should have a rationale that you can define and measure. Good record keeping helps you define and put your money and effort where the need is, rather than simply responding to poorly defined advertising claims. By objectively measuring results, you'll be rewarded with the satisfaction of knowing your time and money weren't wasted and, most likely, with a healthier, happier equine partner. My friend Kathleen, who sent the email below to her friends, is a co-moderator on the Equine Cushing's group and is part of a group we call "The Balance Babes" - helping those who arrive at the EC List (often with a severely laminitic or foundered horse) sort through the options. ; an injury in the Fall of 2007 led to above the knee amputation. While not without some down times, her progress from goal to goal has been an illustration of grit, determination and spirit. Not only has Kathleen given unselfishly to other horse owners, as "Dr. Gustafson" her research is making a difference in human pre-natal care. Hello All - a quick note - I'm doing well. I've been riding a few times and walk short distances without assistance. The plan was to upgrade my hydraulic knee later this year to the C-leg, a microprocessor knee that essentially "thinks" for the user, making walking as close to "normal" (like you all!) as possible. It basically takes the thinking out of walking and requires less energy to walk. As it is now, I still have difficulty with uneven terrain, have to plan every step and can walk about a half a block then need to stop and rest before I can go on. I still have to drive across campus to get to my other lab when I used to walk there several times a day. I plan to do more therapy hoping that my stamina will increase. Unfortunately, I found out last Friday that my insurance (Blue Cross and Blue Shield of Kansas) will not cover the C-leg. This is not a huge surprise as insurance companies have been reluctant to pay for prosthetics. Often they limit coverage to "one leg for life" (bummer if you lose your leg as a child!) or cap the bill at $1,000 to $5,000 leaving the amputee to pay the rest. My existing leg cost $30,000 and the C-leg can cost twice that. However, what makes this especially bitter is that Medicare, Medicaid and other Blue Cross and Blue Shield Plans (including BCBS of Kansas City) *will* cover the C-leg. I find it especially ironic that I work for the State of Kansas at the state's premier medical and research facility and watch others exit the prosthetics clinic with a C-leg that my state insurance plan will not cover. You have my permission to forward this email on to others. Please ask your friends to sign the petition to support this much needed bill. Slick & Pretty or Pretty Slick? There's a million ways to get your money in the horse world - most are not new but a slicked up version of something pretty basic. "Ration analysis" or "ration balancing" programs seem to fall in this category. You can go to the NRC Nutrient Requirements of Horses Computer Model website and determine your horse's basic (minimum) requirements for free. No fancy graphs or bells and whistles - but the information is calculated for you in a clear, readable format. You enter your horses weight, class and activity level and the protein. When you click on "Other Nutrients", protein, DE and major mineral requirements are shown on the bottom of the page, with the trace mineral and vitamin requirements listed in the center of the page. You can then enter "dietary supply" - either by selecting from the provided database (which is somewhat limited) or by entering information from a known hay/feed analysis. This will provide information for protein, DE and major minerals only. FeedXL, a program that is initially only addressing feeding conditions in Oz, works much the same as the NRC computer model. They are using an interesting subscription concept, rather than purchasing the program. This does have the advantage of allowing for ongoing updates to their forage and feed databases, along with keeping it more affordable for an average horse owner (for a "one day" one time calculation - monthly or yearly cost begins to approach program purchase costs). They have done a nice job on this - the "results" are displayed in clear, easy to read numerical and graph formats, using correct nomenclature. If all we were concerned with was meeting or exceeding NRC requirements (and they're quite clear that the program's recommendations are higher than NRC), I would suggest that this online model is what we've been looking for. And this could be all many horses need. But, in our experience with metabolically challenged horses, we've learned that balance is not simply meeting/exceeding requirements, but also involves paying attention to mineral ratios. The FeedXL tour example indicates iron at 506% of requirement "... is no cause for concern..." and has an iron to copper ratio of 12:1. This could be problematic for an insulin resistant horse or a horse with inflammatory issues, as excess iron is becoming well documented as a factor in IR and inflammation. "Green" (i.e. no deficiency) is NOT good if an excess of a mineral is problematic. It becomes fairly complicated to explain mineral ratio corrections - each correction affects other minerals which then also may need adjustment. In a computer model, this becomes a multi-step process, but not difficult for a sophisticated program to handle (my spreadsheets actually do it quite easily) but does require some interpretation to ensure recommendations remain within safe limits. I didn't see a provision for entering your own hay analysis results, and only Australian feeds are currently in the database. So, as slick and pretty as this program is, I don't see any real advantage over what you can get from free from the NRC model, plus a little math. *While I do charge for consultations and assistance, I have always made the spreadsheets available at no charge for individual use. I appreciate a "donation" if you find them useful, but it is not required. 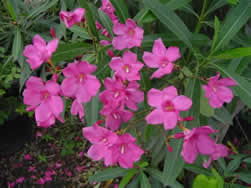 The article Stupid Trees to Have Around Horses at the North Carolina School of Veterinary Medicine website concentrates on three - Oleander, Red Maple and Wild Cherry. In the Southwest, Oleander is everywhere. Its evergreen foliage and beautiful flowers make it an attractive landscape plant, used extensively in new housing development. Unsuspecting newcomers to the area may have oleander planted in close proximity to their horses - or your new neighbors may have planted an oleander hedge right next to your horses' turnout fence line. If this is the case, you may have to resort to offering to pay for and help plant a safer replacement - this will be much less expensive in the long run than the potential veterinary bill (and keep you on better terms with your neighbors - they likely were simply unaware that these plants could harm your horses). One of the most complete listings available is the Cornell University Poisonous Plants Informational Database which lists plants by both common name and scientific name. Another excellent resource is A Guide to Plant Poisoning of Animals in North America from IVIS (International Veterinary Information Service), which lists plants by systems affected (helpful if your horse is showing symptoms and you are trying to determine a possible cause). Accessing IVIS requires free registration. If you're as bad at identifying plants as I am, you can consult with your area cooperative extension agent to walk your land with you and identify potential problem plants.